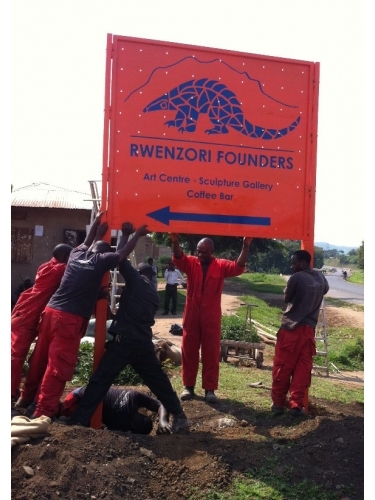 Rwenzori Founders Art Centre, comprising an award-winning Sculpture Gallery, Bronze Foundry and Coffee Bar, lies eleven kilometres north of Kasese in the foothills of Uganda’s impressive Rwenzori Mountains. Supported by UK charity the Ruwenzori Sculpture Foundation, recent winners of Expats Magazine's Community Services Award, this rural centre for the arts was launched in 2008 when three Ugandan craftsmen who trained at Pangolin Editions foundry in England returned home. It has since grown rapidly and the local team now boasts sixteen members. All sculptures are for sale and enquiries are welcomed. Click here to view the video by Steve Russell of the foundry team at work casting some of the exceptional sculptures on show in our award-winning gallery.